Big news for the Bruno Martians. The National Football League (NFL) announced Sunday that pop music sensation Bruno Mars will be performing the halftime show at Super Bowl XLVIII. The 27-year old pop/R&B singer will easily go down in Super Bowl history as being one of the youngest stars to headline the big show, which has annually attracted over 100 million viewers in the United States alone. Beyonce, now 31, performed last year’s Super Bowl. It is also important to point out that Mars’s career is a very fresh one. He exploded on the music scene as a hit songwriter and guest vocalist for acts like B.o.B. (“Nothin’ on You”), Flo Rida (“Right Round”) and Travie McCoy (“Billionaire”) before releasing his debut solo album, Doo-Wops & Hooligans in 2010. That album kicked off a series of number-one hit singles and several Grammy nominations. His follow-up album, 2012’s Unorthodox Jukebox, kicked off three hit singles, including the No. 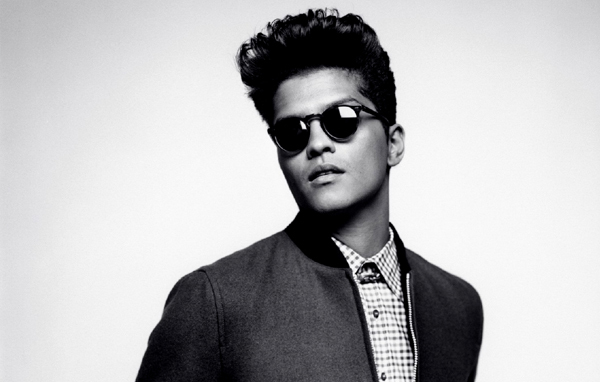 1 smash, “Locked Out of Heaven.” So far, Jukebox has sold over four million albums worldwide. The bigger picture? Mars – born Peter Gene Hernandez in Hawaii – has sold well over 115 million single, which is one impressive feat for such a young artist. Mars is currently in the middle of his “Moonshine” tour with his eight-piece band, The Ho0ligans. Although he did open this year’s Grammy Awards with a stunning live performance of “Treasure” using cascading disco balls and MJ-inspired dance moves, Mars definitely has some large shoes to fill. Previous big acts to perform the halftime show include Madonna, The Who, Bruce Springsteen and the E Street Band, Tom Petty and the Heartbreakers, Prince, the Rolling Stones, Paul McCartney and U2 – all of them locked into the Rock & Roll Hall of Fame and with over thirty years of exeperience to their name. In 1993, Michael Jackson, one of Mars’s musical influences, performed one of the earliest megastar Super Bowl celebrations, kicking off the blockbuster tradition. In some quarters, the halftime show is just as popular as the game itself. Super Bowl XLVIII will be played on Feb. 2 at the MetLife Stadium in East Rutherford, New Jersey.